Tucson Tamale Wholesale Company of Tucson, Ariz., is recalling approximately 915 pounds of beef tamale products. The products contain meat that did not undergo federal inspection. 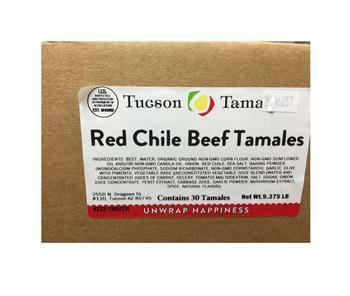 Bulk boxes containing 10- or 11-oz packages of two “Tucson Tamale Red Chile Beef Tamales,” with packaging dates of 8/11/2016, 8/15/2016, 8/22/2016, 8/31/2016 and 9/13/2016, and with case and package codes 2016224, 2016228, 2016235, 2016244 and 2016257. Bulk boxes containing 10- or 11-oz packages of two “Tucson Tamale Chipotle Beef Tamales,” with packaging dates of 8/16/2016, 9/1/2016 and 9/2/2016, and with case and package codes 2016229, 2016245 and 2016246. Bulk boxes containing 10- or 11-oz packages of two “Tucson Tamale Chipotle Beef & Cheese Tamales,” with packaging dates of 8/16/2016, 8/25/2016, 8/29/2016 and 9/2/2016, and with case and package codes 2016229, 2016238, 2016242 and 2016246. The recalled products bear establishment number “EST. M45860” inside the USDA mark of inspection. They were distributed to the firm’s restaurants in Arizona and sold either in restaurants (without packaging), in foil “to-go” containers or with the original packaging intact. Consumers with questions about the recall may contact Todd Martin at (520) 398-6282.